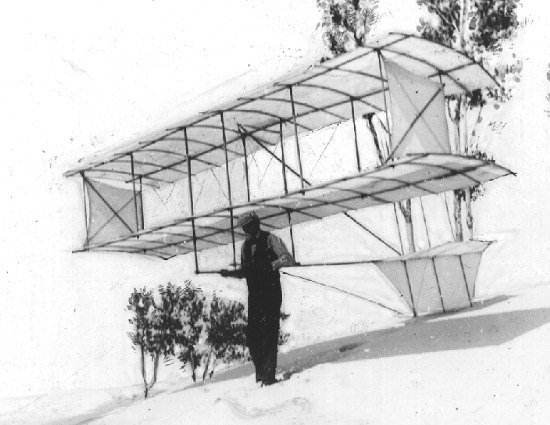 The glider that the Wright brothers referred to as the 'Chanute double decker' was built in July and August of 1896 between the two visits that summer to the Indiana dunes. 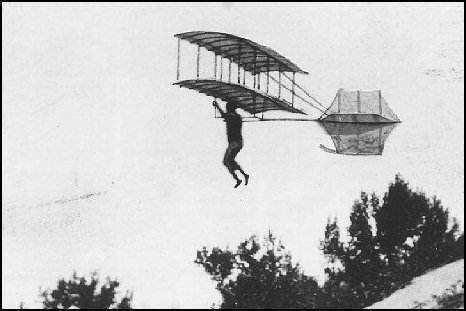 It's trussed bi-plane design would be the model for the Wright brothers in constructing their gliders and eventually their first airplane. First flown at the Dune Park location as a tri-plane on Saturday, August 29th, it was found to be too unwieldy. On Monday the 31st the lower of the three wings was removed and some successful glides were made with the machine. A week of bad weather prevented glides until Friday, when 10 or 12 'beautiful' glides were made, the longest 253 feet. Pictures of this glider were often confused with the Herring-Arnot glider that was flown the following summer. There were more, and better, pictures taken of that very similar glider and they were often used to illustrate the flights of the Chanute-Herring glider. The following images were of the 'original' Chanute-Herring glider. The formal, posed picture shows the side bays which were evidently removed, for they never appear in the flight photos and no mention is made of them in the diary. An overview and comparison of the different gliders is on the 'Originals' page. The following photos courtesy of the Library of Congress and Simine Short.